Puppies (not quite yet) in Paradise... Yesterday Debbie and I made the drive from our house to the home of our breeder's sister (Debbie Miller) in Wells, Nevada. That drive was about three and a half hours each way, though it didn't seem that long to us – because the drive was beautiful! 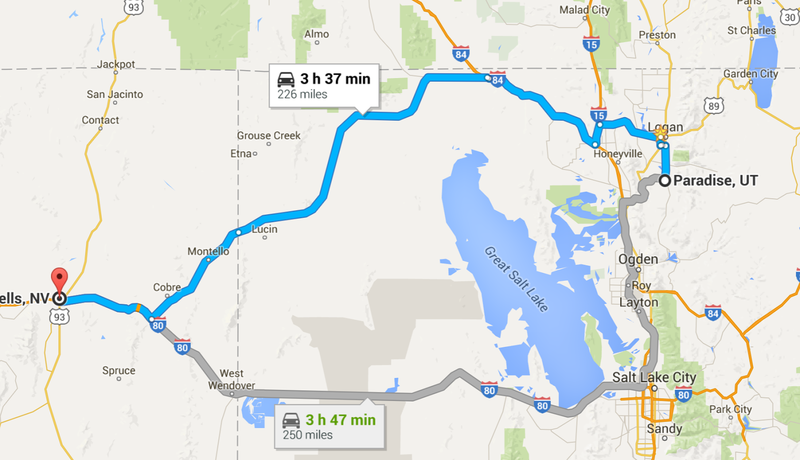 We took a “back road” route, on Utah State 30/Nevada State 223 (really the same road). I've been on this road before a few times, most recently on a trip with my dad around 2005. On that trip we were here in the summer, and the land was dry and dusty. Yesterday, on Debbie's first trip along this route, we got to see just how beautiful this country is in the spring. They'd had rain very recently, and there was still standing water in many places. The countryside was a green as photos we've all seen of Ireland, and we saw quite a bit of wildlife – most especially antelope. Lots of healthy, happy-looking antelope, some of them quite close to the road. We also saw horse, cattle, and sheep babies in abundance, along with a few early wildflowers. It was a thoroughly enjoyable drive. When we arrived at Debbie Miller's house, we thought we'd gotten there about 20 minutes early. It turns out we neglected to take the time zone change into account, and in fact we got there an hour and 20 minutes early. Oops! Debbie Miller graciously did not throw us out on the street, and instead we had a nice visit with her while we waited for Sheila to show up with the puppies. Debbie Miller has three beautiful black field spaniels (a huge treat for us!) and a cute little beagle who looks totally overwhelmed by the (relatively) massive field spaniels. All were curious and friendly with us. Finally, right on (the correct) time, Sheila showed up. Not only had she brought the puppies and their mom (Sissy), she'd also brought a dog we didn't even know about: Frankie the black-and-tan field spaniel. Frankie is one gorgeous dog, with all the beauty of a field spaniel combined with a two-tone “paint job”. Unfortunately Frankie came with some behavioral and training baggage, and Sheila has quite a bit of work to do to whip her into shape. On the appearance side, though, Frankie is just plain a knock out. Sissy, the mom, reminded Debbie and I very strongly of Lea, our first field spaniel. She died about a year and a half ago, and both of us found the close resemblance in Sissy's face quite startling. Sissy is a beautiful dog herself, with a great dog personality – and she's a terrific mom, too. It was easy to see why Sheila is so closely attached to her. We still don't know if we're going to get one or two puppies from this litter, but Sheila told us it's looking a bit more likely that we can have two. Woo hoo!